When New Orleans received its National Football League franchise in 1966, voters amended the state constitution to impose a tax on hotel rooms in Orleans Parish to fund construction of the Louisiana Superdome. To ease the burden of the new tax, the City of New Orleans agreed to suspend its then-1% sales tax as applied to hotel rooms. This was envisioned as a temporary measure to boost the fledgling tourism industry in New Orleans. More than half a century later, tourism is thriving. Several new hotel taxes dedicated to tourism marketing and conventions have supported this growth. Yet the City’s tax remains suspended. This means that the City can apply only 1.5 percentage points of its 2.5% sales tax to hotel rooms. This “lost penny” of hotel tax will deprive the City of an estimated $12.3 million in 2019. That is money the City could have used to address pressing needs, including improvements to drainage, streets and public safety. 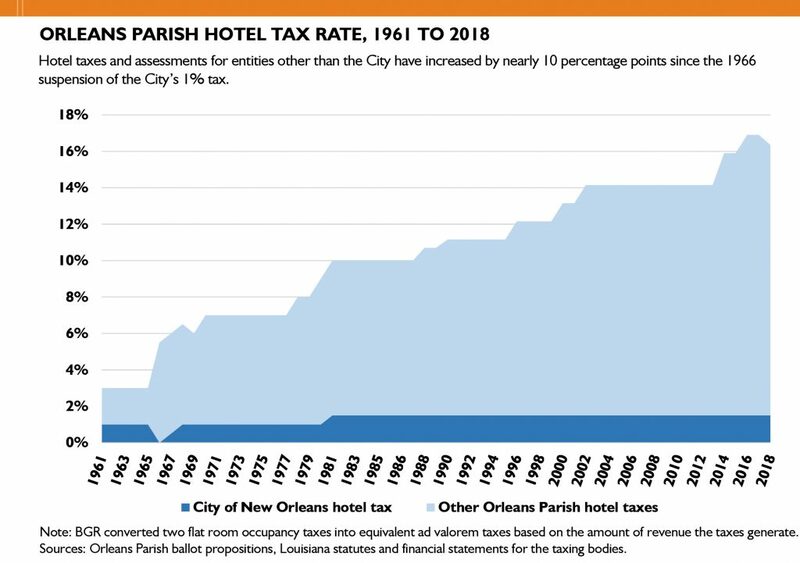 Against this backdrop, The Lost Penny: An Analysis of the Orleans Parish Hotel Tax Structure analyzes the hotel tax structure in Orleans Parish, focusing primarily on the share of revenue available for general municipal purposes. It explains the origin and details of the current tax structure and compares it to best practices for taxation as well as state and national norms. It then reviews and recommends options to align the Orleans Parish hotel tax structure with these best practices and norms. Hotel guests in New Orleans pay 16.35% in hotel taxes on their room charges. Hotel taxes will yield an estimated $200 million in 2019, accounting for about one-sixth of all local tax revenues in Orleans Parish. Of this amount, 75.5%, or $150.9 million, goes to entities that support tourism marketing, conventions and professional sports. The share for general municipal purposes is 9.5%, or $18.9 million. The suspension of the City’s 1% sales tax on hotels is unusual. In the vast majority of large parishes and peer cities, the full local sales tax applies to hotel room charges. In addition, the annual share of hotel taxes allocated to general municipal purposes in New Orleans would have to increase by the equivalent of a 1.3% tax ($15.8 million at current revenue levels) to match the median share for the peer cities. Economic research indicates hotel taxes are a highly effective means of charging visitors for the cost of municipal services and infrastructure they use. However, the suspension of the City’s sales tax on hotels prevents New Orleans from fully realizing these fiscal benefits. There are indications that a partial restoration of 0.55 of a percentage point of the City’s suspended tax ($6.8 million currently) would not negatively impact tourism. The overall tax rate would increase from 16.35% to 16.9%. This was the tax rate for two years until mid-2018, and several metrics suggest the higher rate did not depress tourism. The New Orleans Ernest N. Morial Convention Center has accumulated $235 million in unrestricted reserves largely because it continues to receive a 1% hotel tax, two hotel tax dedications, and a citywide food and beverage tax ($22 million in total for 2019) that were originally intended for an expansion project it deferred indefinitely after Hurricane Katrina. The center’s new five-year $557 million capital plan could decrease the unrestricted reserves to $122 million upon completion of the plan in 2022. However, the reserves could begin growing again by $25 million a year in 2023, according to a financing scenario the center’s financial consultant prepared. Orleans Parish’s hotel tax structure lacks accountability and transparency in certain areas. The permanent or indefinite duration of virtually all hotel taxes deprives citizens and policymakers of the opportunity to periodically reassess the need for taxes through a renewal process. Also, a complex web of laws and revenue-sharing agreements that are not readily accessible make it difficult for the public to understand where hotel tax dollars are going and for what purposes. The Legislature should increase hotel taxes for general municipal purposes in New Orleans by at least the equivalent of a 1% tax ($12.3 million currently). To accomplish this, legislators should strongly consider restoring at least a portion of the City’s suspended 1% sales tax on hotel rooms for high-priority needs. To make up any difference, they should first look to redirect a portion of any excess hotel tax revenues to minimize or avoid negative impacts on the current operations of other hotel tax recipients. The report also makes a series of recommendations to the Legislature to improve accountability and transparency in Orleans Parish’s hotel tax structure. These include imposing definite sunset dates on hotel taxes so citizens or legislators can periodically reassess them.